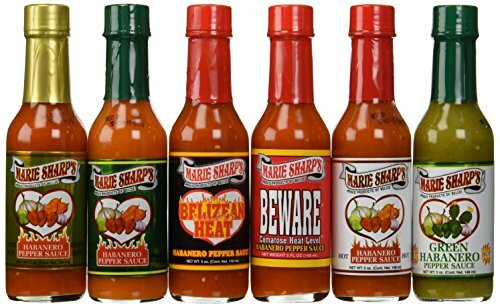 Marie Sharp's Fiery Hot Habanero Hot Sauce 10oz (10 FL.OZ. / 296 ml): Marie Sharp's Habanero Pepper Sauce is the finest product of its kind. This unique carrot-based blend achieves the perfect balance between flavor and heat. Ingredients: Select Red Habanero Peppers, Fresh Carrots, Onions, Lime Juice, Vinegar, Garlic, and Salt. Marie Sharp's hot Habanero pepper sauce's a perfect balance between flavor and heat. Marie achieves the wonderful, complex flavors by using only the freshest ingredients. A great table sauce that will have you coming back for more. Nestled in the foothills of the Mayan Mountains, Marie Sharp's factory still creates products the old fashioned way: using the freshest vegetables and the finest ingredients. Her secret homemade recipe utilizes the potent red Habanero pepper. Produced in the fertile paradise of Belize. Marie has spent many years cultivating a Habanero worthy of her recipe. She has succeeded. Marie Sharp's fiery hot habanero pepper sauce 5 ounce, fiery hot is back. Look out. It will fire up your mouth. Marie achieves the wonderful, complex flavors by using only fresh ingredients. This unique carrot-based blend achieves the perfect balance between flavor and heat. Nestled in the foothills of the Mayan mountains, Marie Sharp's factory still creates products the old fashioned way. Her secret homemade recipe utilizes the potent red habanero pepper. Produced in the fertile paradise of Belize, her red habanero is considered to be the hottest variety of pepper known to man. 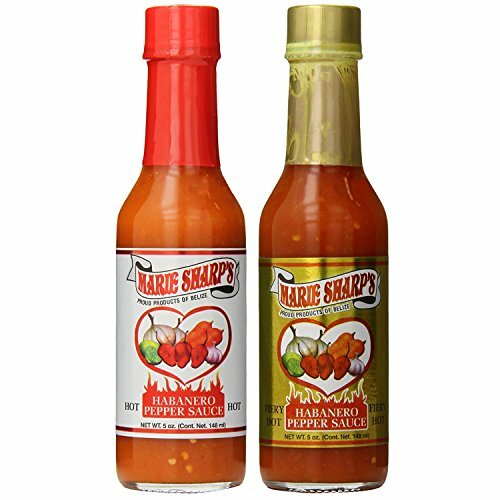 Marie Sharp's HOT Habanero Hot Sauce 5oz and FIERY HOT are Produced in the fertile paradise of Belize. Get this 2-pack combo for regular heat and "fiery" heat./ Marie Sharp's Habanero Pepper Sauces is the finest product of its kind. This unique carrot-based blend achieves the perfect balance between flavor and heat. Nestled in the foothills of the Mayan Mountains, Marie Sharp's factory still creates products the old-fashioned way: using the freshest vegetables and the finest ingredients. Her secret homemade recipe utilizes the potent red habanero pepper. 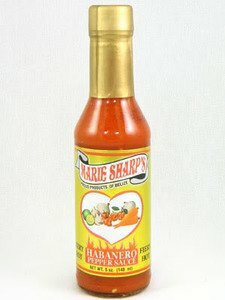 Marie Sharp's Sweet Habanero Hot Sauce | 5 oz. This is a hotter version of the very popular table sauces from the Marie Sharp's collection. Marie Sharp's Habanero Pepper Sauces is the finest product of its kind. This unique carrot-based blend achieves the perfect balance between flavor and heat. Nestled in the foothills of the Mayan Mountains, Marie Sharp's factory still creates products the old-fashioned way: using the freshest vegetables and the finest ingredients. Her secret homemade recipe utilizes the potent red habanero pepper. Produced in the fertile paradise of Belize, her red habanero is considered to be the hottest variety of pepper known to man, Marie has spent many years cultivating a habanero worthy of her recipe. Marie Sharp's Fiery Hot Habanero Hot Sauce is evidence that she has succeeded. Ingredients: Select Red Habanero Peppers, Fresh Carrots, Onions, Lime Juice, Vinegar, Garlic, and Salt. Red Hot Ryan, Marie Sharp's Habanero Pepper sauce Review! 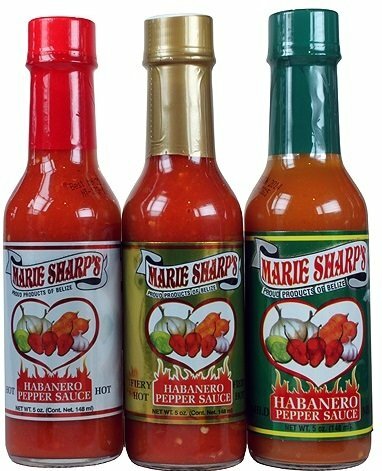 Compare prices on Marie Sharps Fiery Hot at ShoppinGent.com – use promo codes and coupons for best offers and deals. Start smart buying with ShoppinGent.com right now and choose your golden price on every purchase.